Let WITS contact you, leave your details. Virtual Reality (VR) and Augmented Reality (AR) are not new concepts; it’s just that when they were first introduced into the world, the technology to support them or help them go main stream was very expensive. As faster, smarter, cheaper and immersive technologies become readily available; users start to adapt their consumption habits to accommodate these new technologies. As compared to a website or a regular mobile app which most brands use as current means to engage with their users, Virtual Reality & Augmented Reality have the potential to give a greater emotional resonance to objects and topics. Virtual Reality and Augmented Reality, if planned and executed well, can be powerful platforms for businesses to build and enhance their customer experiences. VR is a computer-generated simulation of a three-dimensional image or environment that can be interacted with in a seemingly real or physical way by a person using special electronic equipment, such as a head mounted display (HMD), controllers/gloves fitted with sensors to track movement within the three-dimensional image or environment. Entry level, mass-market VR headsets like Google Cardboard which start at a couple of hundred rupees to a mid-level HMDs (head mounted display) like Google Daydream VR or Samsung Gear VR which is in the 8,000 to 10,000 rupee range, and then the premium HMDs like Oculus Rift and HTC Vive which cost close to a Lakh rupees. Training – Companies in various sectors like insurance, manufacturing, law enforcement, etc. are using VR to train their employees on how to handle various scenarios. For example, Samsung is using VR for their production line training because it not only saves on cost but it is also more efficient. Under the new VR training program, an employee uses a headset and holds a specially designed tool to work through the manufacturing processes. It allows the trainees to physically get used to the most important steps of the manufacturing process. Healthcare – Healthcare companies are currently using Virtual Reality to demonstrate what it feels like for a patient to experience medical conditions such as migraines and vertigo. On wearing the VR headset, relatives/friends of the patient get a first-hand experience of what the patient is suffering through when these conditions are triggered. AR is a technology that superimposes a computer-generated image on a user's view of the real world, thus providing a composite view. Augmented Reality as a technology and a medium is growing at a really rapid pace and businesses across the globe are adopting it to meet their business objectives. This is primarily because unlike VR which needs investment in specific hardware to experience the content, Augmented Reality can be experienced on any smartphone/tablet, which is getting cheaper and more powerful. Moreover, with the newly released ARKit from Apple for iOS devices, developers have been busy playing around with ARKit and have already rolled out a number of cool apps. These apps give us a glimpse of the future of AR, and it looks very promising. It is also projected that 500 million iOS devices will be ARKit-compatible by the end of 2017. In addition, Google have also announced their own AR software, ARcore, which will be available to 100 million android devices in the coming months. Retail – Amazon’s new AR app, ARView, allows customers to visualise what furniture and home décor will look like in their homes or office setting. IKEA have also released a similar AR app experience for their customer as well. Travel/Tourism – iButterfly, is an Augmented Reality app created by advertising agency Dentsu that allows users to catch and collect digital "butterflies" that pop-up in camera view. Once caught, the butterflies release offers for nearby shops and restaurants as well as other informative content. Currently available only in Japan, the app will soon extended to the rest of Asia. What is Mixed Reality (MR)? MR is a form of Augmented Reality that is somewhere between VR and AR. Mixed Reality augments the real world with virtual objects that aim to look as if they are really placed within that world. While MR headsets are still in the development phase, two companies most prominent with this technology are Microsoft and Magic Leap. Microsoft’s HoloLens has the most traction, as there have been multiple demos showcased online on how the headset will change the way we interact with the world in the very near future. 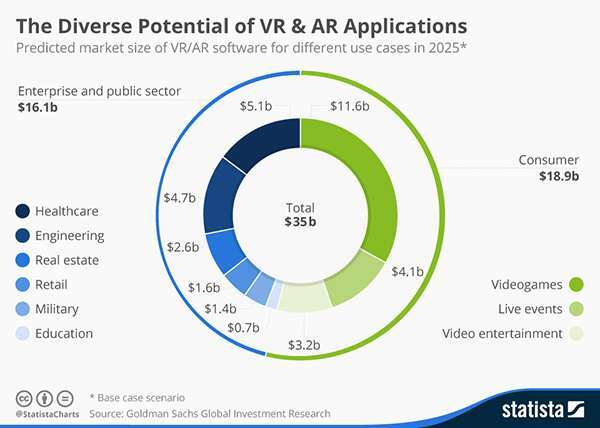 Research done by Goldman Sachs Global Investment, showcases the predicted market size of VR & AR software across multiple industries. There is a growing market for these immersive techs, and with the promise of VR & AR applications, businesses should leverage these tools as it will not only help them save time and money, but also bring about a transformation in approaching ideas/experiences that could possibly disrupt the current business landscape.